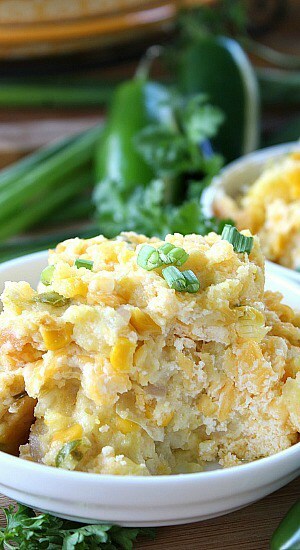 This corn casserole is the perfect side dish! 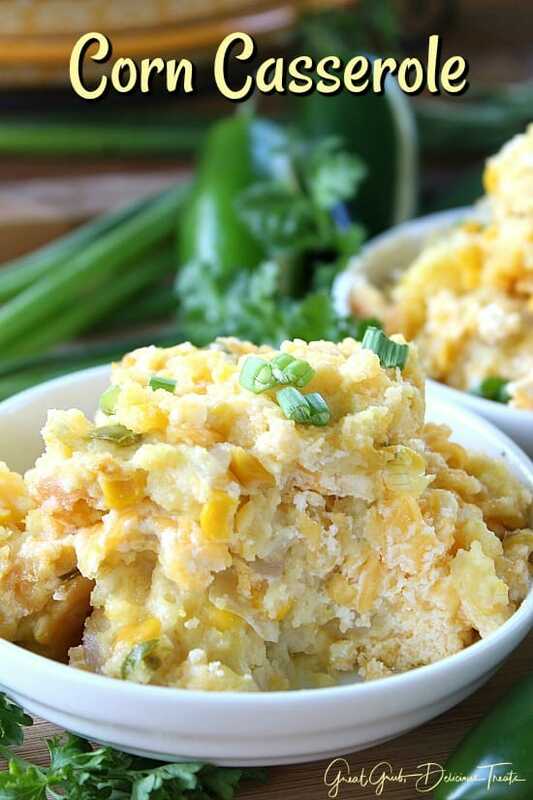 Loaded with cheese, this corn casserole is full of flavor from the two different types of onions, the delicious corn and muffin mix as well as the spiciness of the jalapeños, mixed all together for one delicious dish. My friend, Eric, who is a Social Worker at my work, has some awesome recipes. 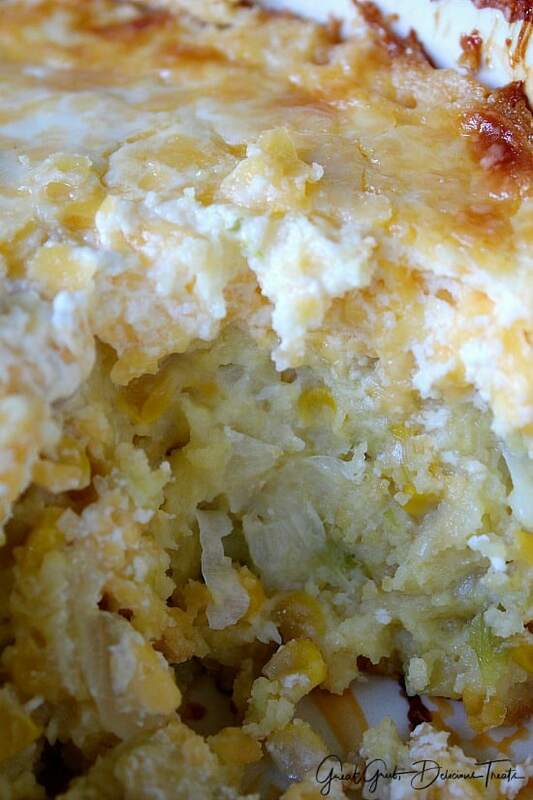 We have been talking all kinds of food lately and he brought me a bowl full of this tasty casserole. 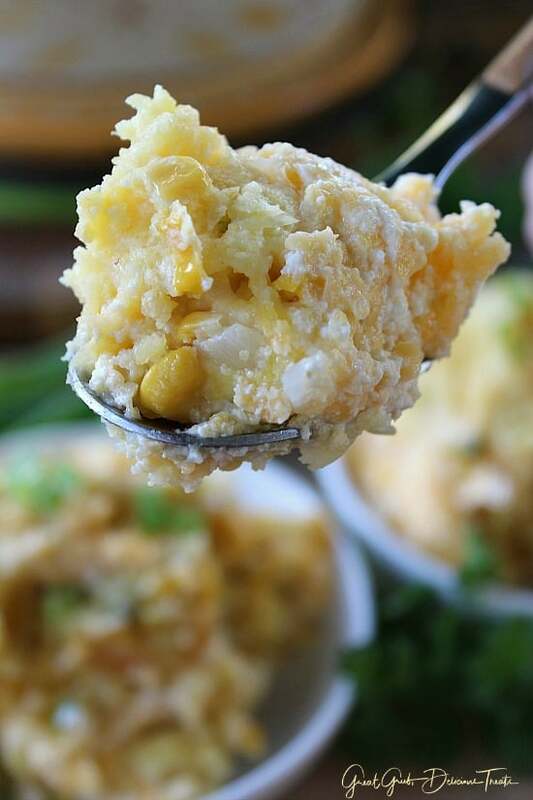 Well, we kept missing each other and needless to say, I didn’t get to taste his recipe so I decided I’d make it myself, which I knew I would, knowing how wonderful corn casserole is. 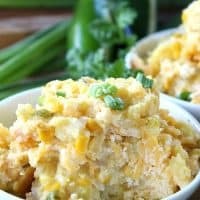 I’ve had corn casserole many times before and his recipe is super tasty, it’s loaded with cheese and sour cream, as well as lots and lots of onions which enhances the flavor even more. The only thing I did differently from Eric’s original recipe was to add an extra cup of grated cheese and 1/4 cup of jalapeños. Oh man, yummy! Either way it’s made, it is super delish! One of the tricks Eric told me he does is when he’s adding the corn/muffin mix to the pan is that he waits to add the whisked eggs for a little bit and then adds the eggs on top of the corn mixture after about a minute or so. Stir and cook the mixture until it starts to set up. Once it starts to set up, transfer to a 2 or 3 quart baking dish which has been lightly sprayed with a non stick spray. Bake uncovered for about 50-60 minutes. 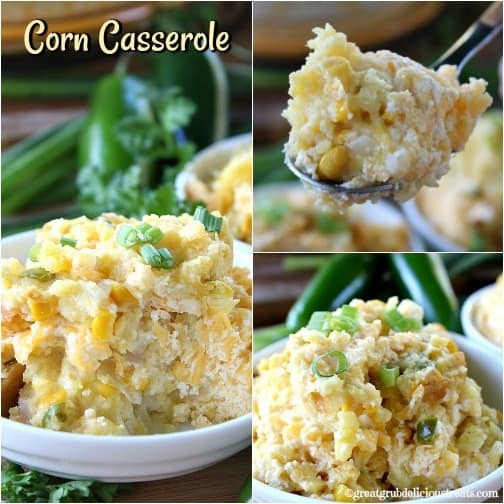 Ready for this corn casserole? 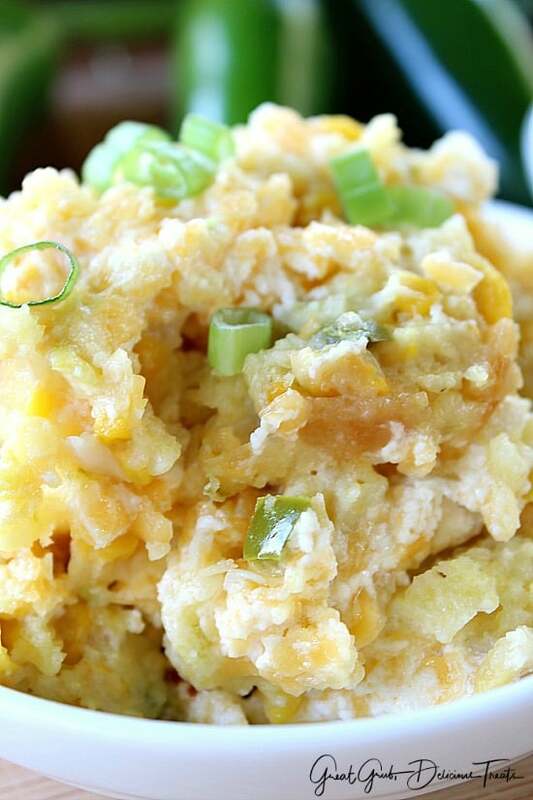 Here is another delicious side dish that our family absolutely loves and is to die for! 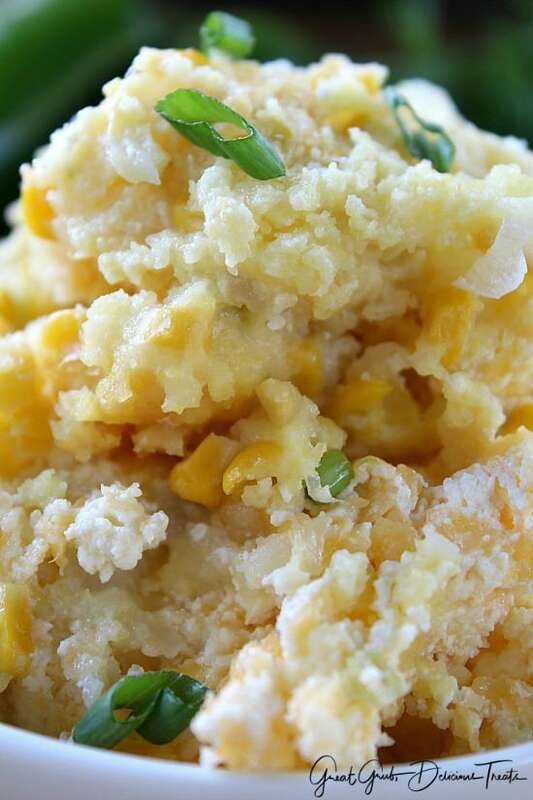 Hot corn salad is definitely a family favorite. Lightly spray a 2 or 3 quart baking dish with a non stick spray, set aside. In a large frying pan over low/medium flame, saute both types of onions and jalapeños in butter until soft, approximately 8 minutes. 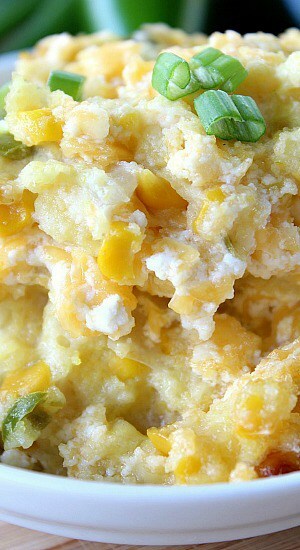 Add corn, cream corn and muffin mix to a medium mixing bowl, stir, and add to pan. Whisk eggs and pour on top of muffin mix and stir. Continuing stirring until mixture starts to set up. Once mixture has set up, transfer to baking dish. Grab another medium mixing bowl, stir grated cheese and sour cream together until mixed thoroughly. Spread evenly on top of muffin mixture. Bake uncovered for 50-60 minutes in a 2 quart baking dish, 45-50 minutes in a 3 quart baking dish.